Please click on the short description to read full article. AH Technology (Aust) a distributor of Raz-Lee Security Inc., a leading vendor of security and compliance solutions for IBM i (AS/400) systems, announces the immediate availability of Authority Inspector. AH Technology (Aust), the distributor of Raz-lee Security inc. announced that Syslog real-time notification messages now support TLS encryption in all iSecurity products. iSecurity will automate your otherwise manual and time consuming security, audit & compliance tasks; alert you to breaches in real time, & deliver compliance reports & scorecards as needed. To alleviate the burden and suffering of our IBM i security colleagues, IBM Lab has introduced the 'Quick Security Check' that will pin point security vulnerabilities in your iSeries. Raz-Lee Security Inc., a supplier of information security and compliance solutions for the IBM i. 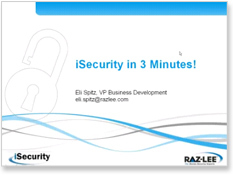 News and information on Raz-Lee's new iSecurity products and features, marketing tidbits and tips and tricks. News and information on Raz-Lee's market-leading Power i security, auditing and compliance solutions. After a successful COMMON 2010 conference in Orlando, we are busy helping distributors and customers worldwide benefit from our state-of-the-art security, auditing and compliance solutions. Raz-Lee is proud to announce a new release of FileScope which includes market UNIQUE support for Unicode, support for SIEM integration through Syslog and SNMP and improved E-mail support.